The summer is back in India and the most awaited IPL 2019 is also back. The Full IPL Schedule 2019 will be declared by Monday. If you are looking for the IPL 2019 Schedule then you are at the right place. You can find a complete Indian Premier Schedule on this post. Summers have just arrived in India and as per the expectation, the festive season of sports i.e is IPL 2019 has arrived earlier. The concerned authority (BCCI) has announced 17 matches schedule and the complete schedule is expected to be out any time soon this week. All the respective franchises like Chennai Super Kings (CSK), Royal Challengers Bangalore (RCB), Delhi Capitals (DC), Mumbai Indians (MI), Kolkata Knight Riders (KKR), Rajasthan Royals (RR), Kings XI Punjab (KXIP) and Sunrisers Hyderabad (SRH) have started their preparations. RCB (Royal Challengers Bangalore) lead by Virat Kohli and DC (Delhi Capitals) lead by Shreyas Iyer will play five games. All the other teams like Royal Challengers Bangalore (RCB), Mumbai Indians (MI), Sunrisers Hyderabad (SRH), Kolkata Knight Riders (KKR), Kings XI Punjab (KXIP) and Rajasthan Royals (RR) will play five games each in the first half of the IPL. You can read the IPL Match Prediction here. MA Chidambaram Stadium, Chennai. 8:00 PM, 02:30 PM GMT, 08:00 PM LOCAL. Eden Gardens, Kolkata. 4:00 PM, 10:30 AM GMT, 04:00 PM LOCAL. Wankhede Stadium, Mumbai. 8:00 PM, 02:30 PM GMT, 08:00 PM LOCAL. Sawai Mansingh Stadium, Jaipur. 8:00 PM, 02:30 PM GMT, 08:00 PM LOCAL. Feroz Shah Kotla, Delhi. 8:00 PM, 02:30 PM GMT, 08:00 PM LOCAL. Eden Gardens, Kolkata. 8:00 PM, 02:30 PM GMT, 08:00 PM LOCAL. M.Chinnaswamy Stadium, Bengaluru. 8:00 PM, 02:30 PM GMT, 08:00 PM LOCAL. Rajiv Gandhi International Stadium, Hyderabad. 8:00 PM, 02:30 PM GMT, 08:00 PM LOCAL. Punjab Cricket Association IS Bindra Stadium, Mohali. 4:00 PM, 10:30 AM GMT, 04:00 PM LOCAL. Rajiv Gandhi International Stadium, Hyderabad. 4:00 PM, 10:30 AM GMT, 04:00 PM LOCAL. Punjab Cricket Association IS Bindra Stadium, Mohali 8:00 PM, 02:30 PM GMT, 08:00 PM LOCAL. Sawai Mansingh Stadium, Jaipur 8:00 PM, 02:30 PM GMT, 08:00 PM LOCAL. 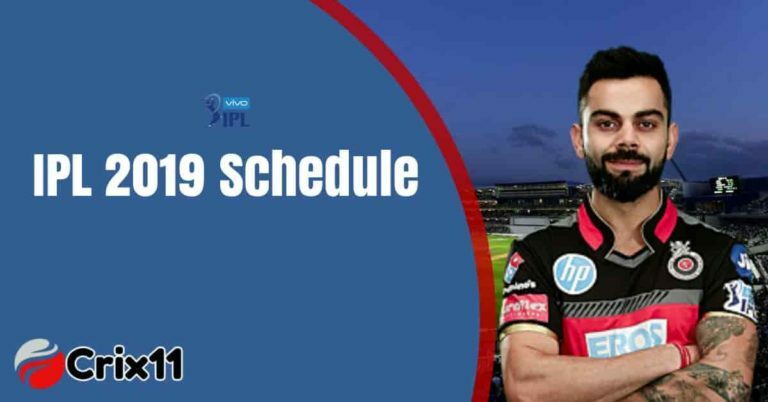 The time table of IPL 2019 was prepared in such a way that all the teams will play two matches in their respective home ground and two matches are scheduled away. The home ground of CSK is MA Chidambaram Stadium, Chennai. The MS Dhoni lead team will play their 1st match and 12th match of this Indian Premier League at Chennai. CSK will play two matches away from their home which is scheduled to be played at Feroz Shah Kotla, Delhi against DC and Wankhede Stadium, Mumbai against MI. The home ground of RCB is M.Chinnaswamy Stadium, Bengaluru. The Virat Kohli lead team will play the 7th and 17th match on this particular venue. RCB will play three matches away from their home. Royal Challengers Bangalore will play the 1st match at MA Chidambaram Stadium, Chennai against CSK, the 11th match at Rajiv Gandhi International Stadium, Hyderabad against SRH and the 14th match at Sawai Mansingh Stadium, Jaipur against RR. Dinesh Karthik lead team will play their two matches back to back at their home ground. Eden Gardens, Kolkata is the home ground of KKR. Kolkata Knight Riders will play their two matches away from their home ground which scheduled to be played at Feroz Shah Kotla, Delhi against DC and M.Chinnaswamy Stadium, Bengaluru against RCB. The home ground of Sunrisers Hyderabad is Rajiv Gandhi International Stadium, Hyderabad. They will play two matches at Hyderabad. Kane Williamson lead team will play the 2nd match at Eden Gardens, Kolkata against KKR and the 16th match against DC at Feroz Shah Kotla, Delhi. MI will play the 3rd and the 15th match at Wankhede Stadium, Mumbai which is the home ground of Rohit Sharma lead Mumbai Indians. Mumbai Indians will play the 7th match against RCB at M.Chinnaswamy Stadium, Bengaluru and the 9th match against KXIP at Punjab Cricket Association IS Bindra Stadium, Mohali. Along with RCB, Delhi Capitals will also play five matches in the first half of the IPL 2019. Feroz Shah Kotla, Delhi is the home ground of DC and they will play the 5th, 10 and the 16th match at Delhi. The Shreyas Iyer lead team will play their next two matches away from their home. They will play the 3rd match against MI at Wankhede Stadium, Mumbai and the 13th match against KXIP at Punjab Cricket Association IS Bindra Stadium, Mohali. The home ground of RR is Sawai Mansingh Stadium, Jaipur. The Ajinkya Rahane lead team will play the 4th and 14th match at Jaipur. Rajasthan Royals will play their remaining two matches away from home. They will play the 8th game against SRH at Rajiv Gandhi International Stadium, Hyderabad and the 12th match against CSK at MA Chidambaram Stadium, Chennai. The home ground of KXIP is Punjab Cricket Association IS Bindra Stadium, Mohali. The Ravichandran Ashwin lead team will play the 9th and the 13th match at Mohali. KXIP will play the remaining two games away from their home. KXIP will play the 4th game against RR at Sawai Mansingh Stadium, Jaipur and the 6th match against KKR at Eden Gardens, Kolkata. You can read the Complete Squad here. This is the complete IPL Schedule 2019. The full IPL 2019 schedule will be published very soon. The time table of IPL is prepared in such a way that it does not affect the election. You can follow us on our facebook to get all the IPL related news, IPL prediction, Where to book online tickets for IPL.